By 1967, many critics and record buyers regarded Elektra Records as a folk rock label, that had released albums by some of the genre’s finest exponents including Judy Collins, Love, Tom Rush and Tim Buckley. Many of these albums would later become important and influential albums, and some are nowadays regarded as genre classics. However, some people’s perception of Elektra Records was about to change in May 1967 with the release of The Zodiac’s album Cosmic Sounds, which became a cult classic. That is the still the case in 2017 when Elektra Records reissued the fiftieth anniversary version of Cosmic Sounds on luminous vinyl. The Zodiac’s Cosmic Sounds was a groundbreaking concept album which featured twelve tracks that were described as psychedelic mood music. It featured a myriad of exotic and electronic instruments and spoken prose that came courtesy of Cyrus Faryar. Cosmic Sounds was no ordinary album, and The Zodiac was no ordinary band. That was certainly the case. The Zodiac didn’t even exist before the recording of Cosmic Sounds. Jac Holzman the head of Elektra Records came up with the concept for Cosmic Sounds after the success of The Doors’ eponymous debut album which had been released in January 1967. He then set about making The Zodiac and their debut album Cosmic Sounds reality. To do that, Jac Holzman hired Alex Hassilev, formerly a member of The Limeliters, to produce the album. Alex Hassilev brought onboard Mort Garson who he had recently formed a production company with, to write the music for Cosmic Sounds. With producer Alex Hassilev and composer and musician Mort Garson onboard, the Cosmic Sounds’ concept quickly grew legs, and the pair were planning to record and release a series of similar concept albums. Before that, Mort Garson began work on Cosmic Sounds. Eventually, composer, arranger, orchestrator, conductor and pianist Mort Garson had written twelve tracks, with one for each astrological sign. This included Aries-The Fire-Fighter, Taurus-The Voluptuary, Gemini-The Cool Eye, Cancer-The Moon Child, Leo-The Lord of Lights, Virgo-The Perpetual Perfectionist, Libra-The Flower Child, Scorpio-The Passionate Hero, Sagittarius-The Versatile Daredevil, Capricorn-The Uncapricious Climber, Aquarius The Lover Of Life and Pisces-The Peace Piper. These tracks would become Jac Holzman’s album of psychedelic mood music-Cosmic Sounds. By then, producer Alex Hassilev had returned from producing The Dusk ‘Till Dawn Orchestra’s Sea Drift album. One of the tracks incorporated a piece of music that was meant to feature on a followup album, The Sea. However, it had been scrapped, after Rod McKuen, who was meant to feature on the project, left and worked on his own version with Anita Kerr. This had been a disappointment, but Alex Hassilev was fully focused on producing Cosmic Sounds. To record Cosmic Sounds, and capture the sounds that producer Alex Hassilev required wasn’t going to be easy. It would require a variety of exotic and electronic instruments. Fortunately, Alex Hassilev knew a couple of musicians who could help create the sound that he was looking for. This included Paul Beaver, who back in 1967, was known as someone who provided sound effects for the film industry. He was also passionate about the new electronic instruments and had amassed an enviable collection, including a Moog synth. He would play the Moog and other electronic instruments on The Zodiac. In 1967, the Moog synth was a new instrument, which its inventor Robert Moog and Paul Beaver had just demonstrated at the California Audio Engineering Society convention in early 1967. This was the assembled audience got the opportunity to see and hear the Moog on the West Coast. They realised it was a gamechanger, as did Jac Holzman the head of Elektra Records. The Moog he knew would play an important part on Cosmic Sounds. With Paul Beaver onboard, producer Alex Hassilev was keen to enlist percussionist Emil Richards, who had played with great and good of music, and on over 1,700 movies. Emil Richards was also a collector percussion instruments, and had already amassed a collection of 700 instruments from all over the world. He would put some of the strange and exotic percussion to good use on The Zodiac. The day of the recording sessions, electronics guru Paul Beaver setup his Moog synth, and an array of electronic instruments. When percussionist Emil Richards arrived at the studio, it was in a truck. As members of the band looked out, they were amazed to see that half of the truck was filled with myriad of exotic percussion instruments including water chimes and angklungs, bamboo rattles from Southeast Asia. They were unloaded from the truck, along with a sitar and harpsichord. These instruments were taken into the studio, where producer Alex Hassilev introduced Emil Richards to the rest of the band. It featured some of L.A’s top session musicians, including members of the legendary Wrecking Crew were waiting. This included drummer Hal Blaine, who was joined in the rhythm section to bassist Carol Kaye. They were joined by keyboardist Mike Melvoin and Bud Shank on bass flute. Other members of this experienced group of musicians that recorded Cosmic Sounds weren’t credited on the album. With The Zodiac in the studio, they began recording the twelve tracks that became Cosmic Sounds. Mostly, the recording sessions ran smoothly. The only problem the band encountered was that the Moog’s oscillators were somewhat unstable and this meant that Paul Beaver had switch the machine on way before the sessions began, to allow them to warm up. Occasionally, the Moog failed to stay in frequency and the tuning was out. Apart from that, there were very few problems. What many members of the band remembered, was percussionist Emil Richards dashing round the studio playing anything up to five or six instruments live. Somehow, he managed this and after four recording sessions, the twelve backing tracks were recorded. With Cosmic Sounds complete, The Zodiac listened to the playback, and listened intently to the twelve tracks that featured a spacey but tight groove. Cosmic Sounds sounded like an instrumental psychsploitation soundtrack. However, that would soon change. With the backing tracks completed, folk singer Cyrus Faryar was brought onboard to narrate Cosmic Sounds. He was the final member or The Zodiac, and added the twelve vocals against a futuristic, moody, haunting and lysergic backdrop that combined the debut of a Moog synth with a sitar, flute, Hammond organ, haunting harpsichord and even searing, mid-sixties rocky guitar riffs as Cyrus Faryar’s voice veered between ruminative to dramatic and ironic. This was the final piece of the musical jigsaw that was Cosmic Sounds. 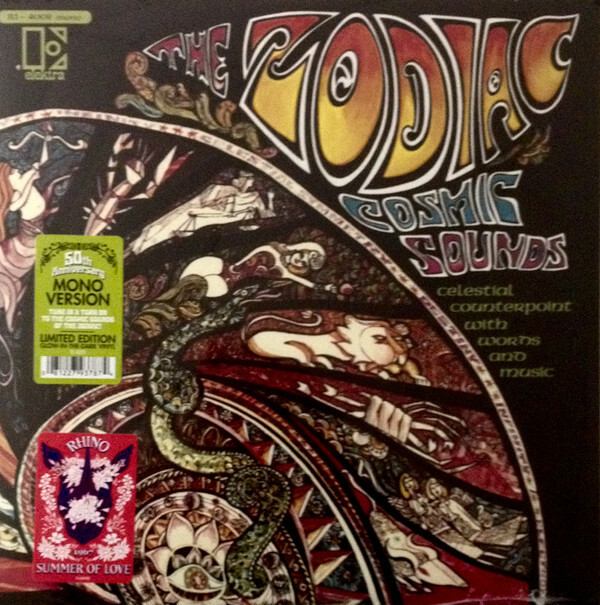 Once Cosmic Sounds was completed, Jac Holzman decided to release The Zodiac’s debut album in May 1967. William S. Harvey was hired to take charge of the artwork on Cosmic Sounds, and must have surpassed even Jac Holzman’s expectations. The elaborate sleeve was a patchwork of bright, bold and gaudy colours, and was almost luminous. It also featured wavy undulating lettering and pictures that were lysergic and had been influenced by classical mythology. This was a perfect cover for The Zodiac’s album of psychedelic mood music, Cosmic Sounds. Not for the first time, Jac Holzman’s timing was perfect, with the release of The Zodiac’s debut album in May 1967 coinciding with a resurgence of interest in astrology, while psychedelia had also become hugely popular. Surely, this was the perfect time for The Zodiac to release their groundbreaking and innovative concept album Cosmic Sounds? It was sure to appeal to those who were about to turn on, tune in, drop out. Unfortunately, Cosmic Sounds divided the opinion of critics, many of whom failed to understand this groundbreaking and imaginative album of psychedelic mood music, which came with instructions that the album “must be played in the dark.” Some critics embraced and understood the album, and were won over by its mixture of exotic and electronic instruments and spoken prose. It was essentially a fusion of psychedelia, rock and astrology played by some the of L.A’s top musicians and narrated by Cyrus Faryar. This Jac Holzman hoped would tap into the burgeoning market for all things psychedelic. Unfortunately, there was a degree of confusion amongst critics and soon, record buyers who were unsure about who the album was by. Some thought that the album was The Zodiac by Cosmic Sounds, while others were of the opinion that the album was Cosmic Sounds by The Zodiac. Even after looking at the sleeve and the insert critics and record buyers remained confused. This wasn’t good news for Jac Holzman who had masterminded Cosmic Sounds. It was his concept, and one that he hoped would cash-in in the recent resurgence of interest in astrology and psychedelia’s popularity. Sadly, The Zodiac’s debut album Cosmic Sounds didn’t sell in vast quantities, but still found a small but appreciative audience. Soon, Cosmic Sounds was a cult classic, and for many, who aficionados of psychedelia, the album was part of the soundtrack to the psychedelic era. Some record buyers played the record so often that they got through several copies. Especially as they sat cross-legged on bean bags ingesting tetrahydrocannabinol as lava lamps flickered in the background. Despite the popularity of Cosmic Sounds within some parts of the psychedelic community, the album failed to crossover and find audience within mainstream music fans. By then, Cosmic Sounds was a psychedelic cult classic, and over the next fifty years would be discovered by several new generations of record buyers. ← SWEENEY’S MEN-SWEENEY’S MEN AND THE TRACKS OF SWEENEY.